Tags: best purchase ever, score!, squee! Subject: _Goblin Emperor_ on sale! The acclaimed _Goblin Emperor_ is on sale for 1.99! The link below includes lots & lots of sites & formats. Well, that takes care of reading matter for my next flight. Tweak CSS in Tectonic layout to prevent wandering navlinks. Don't remove the mobile viewport when unchecking 'use layout stylesheet' in settings. Use built-in version parser to compare module versions in checkconfig.pl. Friends, I'd like to talk to you about elitism. Around the world, there are professional organizations such as the A.M.A., the B.M.A., and the C.M.A. -- respectively, the American, British, and Canadian Medical Associations. The Bundesärztekammer, or B.Ä.K. ; that is, the German Medical Association. These, and other groups around the world, work to restrict terms such as "Medical Doctor" and "Doctor of Medicine" to those privileged few who not only have the means to attend medical school, but also are lucky enough to graduate. But friends, you don't have to meekly accept this situation. You can push back. You have the power in your hands... and in your keyboards. A.M.A., B.M.A., C.M.A., and W.H.O. First: ALL OF THAT ADVICE IS BAD. DO NOT FOLLOW ANY OF THOSE SUGGESTIONS. Second: As of this writing, there is no "MeetRealVamps.com". "MeetRealVampires", though, yes. Third: Smoke detectors and their americium are not the most effective/efficient really stupidly dangerous way to get your hands on radioactive material. A good candidate for that questionable distinction might involve "FiestaWare". I will leave the details to the interested student, and strictly disavow any responsibility. Fourth: Trepanation, or trepanning, refers to drilling a hole in someone's skull -- a necessary part of many forms of brain surgery, treatment of hydrocephalus, not to mention demon eviction. Autotrepanation (AKA autotrephanation) is the process of drilling one's own skull. Bzzzzz! And yes, there have been YouTube videos. Several URLs on the Internet Archive were reported as terrorist content, and there's a proposed EU law that would require such content to be taken down within one hour. The link goes into detail as to why this is a very bad idea, as well as showing just how broad the report was. A new kink meme community is up, give_satisfaction ! To accompany the new Wodehouse community, indeedsir . It's completely anonymous (unless you don't want to be). Post kink prompts or answer prompts. We encourage fics, art, vids, whatever you want to create. Not comfortable with showing your writing? give_satisfaction is a safe space to post. IPs aren't logged. 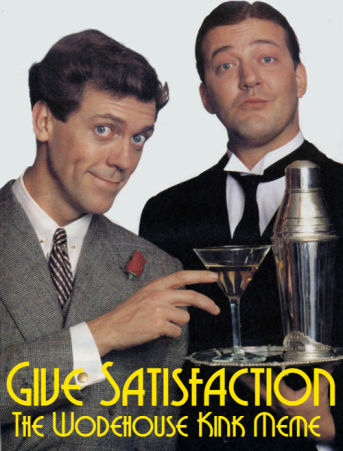 Jeeves/Wooster, Honoria/Madeline, Psmith/Mike, Seppings/Silversmith, any and all pairings/threesomes/moresomes are welcome. Click on the photo to be taken to the comm. Deep Space Nine is described as “dark,” “edgy,” and “the black sheep” of the Star Trek family – a show that did not fit in Gene Roddenberry’s vision of the future. 20 years after it left the airwaves, fans all over the world continue to watch Deep Space Nine with the same affection they feel for the other Star Trek series. Through extensive interviews with cast and creators, show footage presented in HD for the first time anywhere, and brand-new animated storyboards showing what could have been and what still might be, directors Ira Steven Behr (showrunner of the original series) and David Zappone (Star Trek docs The Captains and For the Love of Spock), bring you What We Left Behind: Looking Back at Star Trek: Deep Space Nine, an in-depth look at this beloved show, its fans, and its ongoing appeal to Trekkies of all ages. This one-night event will include an exclusive two-sided poster (11x17, limited quantities) as well as a roundtable discussion on the making of the documentary. I. and I are scheduled for a concert at FilKONtario, the first event on Friday evening. The portable keyboard that she uses is adequate for basic practising but not very good: 5 octaves, no pedals, and no touch sensitivity (the strength which a key is struck with doesn't affect its volume). Will anyone be there with a better keyboard that we might use? We could also use an accompanist on keyboard for one of I. 's songs, so that she could play violin. Subject: London volunteer weekend, 11th-12th May!